Our spectacular Ningaloo Reef Whale Shark Swims operate daily from March to August. 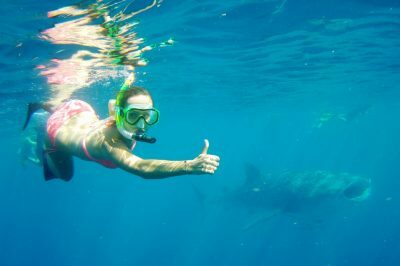 During this time, we offer guests above the age of six the opportunity to undertake the whale shark experience of a lifetime – the chance to get up close and personal with the world’s largest fish. Our whale shark swims give you the opportunity to immerse yourself in the crystal waters of Ningaloo Reef and swim alongside these gentle giants as they cruise the waters of Western Australia’s north west cape, their annual meeting ground for up to six months. A Whale Shark Swim at Ningaloo Reef is a giant tick off your travel experience and dream destination bucket list! Whale shark swims are our specialty! Spend a day with our fully-qualified team and experience the Exmouth Dive & Whale Shark difference. You can expect a fantastic day on – and in – the water, where the comfort and enjoyment of our guests and the whale sharks is our top priority. Our light aircrafts are in the air longer than any other whale shark swim company along the North West Cape, and our boats are always first on the water. Our ‘early bird’ approach means we’re able to spot whale sharks and humpback whales from above and head directly to their location before any other tour company. With no time or money wasted in the search for these majestic leviathans, you’re guaranteed more time swimming with the whale sharks. 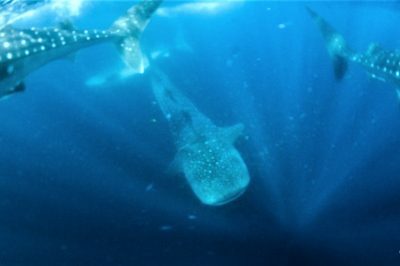 In fact, we’re so confident your experience will exceed your expectations, we back it with our unique Whale Shark Good Swim Guarantee. When you book with the world’s leading whale shark dive team, you can expect professional service from start to finish. You’ll enjoy ample swim time with whale sharks on Ningaloo Reef, where you’re guaranteed to spot many other species of marine life and coral. All tours on our fully-equipped, customised vessels include a full range of refreshments, beverages, and a tasty lunch as well as morning and afternoon tea. Our tour leaders are fully qualified Dive Masters, with years of experience in marine safety, scuba, and snorkeling. 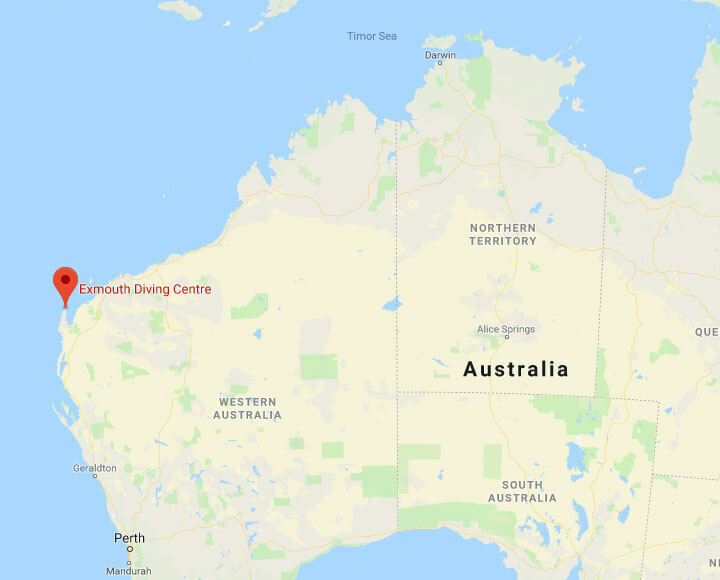 They’re passionate about sharing their knowledge of whale sharks, Ningaloo, and the Exmouth region, and are happy to answer all your questions. We take the safety and wellbeing of our guests – and the whale sharks – very seriously. Our Divemasters are fully trained in in-water rescue operations, and we carry more staff on deck than any other local tour operator. You can be confident we are prepared for swift response, in the unlikely event it is required. Each deluxe swim guest receives a premium video and photos of their whale shark encounter recorded by a professional videographer to keep as a memento of their amazing day. Just fun on the reef with whale sharks! Every year, whale sharks, the world’s largest known fish, make their way to the peaceful waters off the coast of Exmouth in their quest for food. 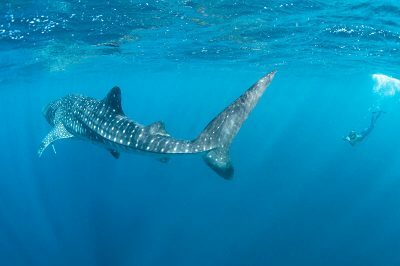 Ningaloo Reef’s remarkable eco-system attracts hundreds of whale sharks with its abundance of naturally-occurring food that starts with the annual spawning of coral in March, and continues with the upwelling of nutrient-rich waters from the continental shelf that lies beneath Ningaloo. With plankton drifting closer to the surface, whale sharks gather en masse at Ningaloo to take advantage of easy, abundant feeding. While whale sharks can grow to an impressive 15 meters in length, and have a mouth almost 1.5 meters wide, they pose no danger to humans. They are calm, slow moving, naturally curious fish that are undisturbed by snorkellers swimming in close proximity. 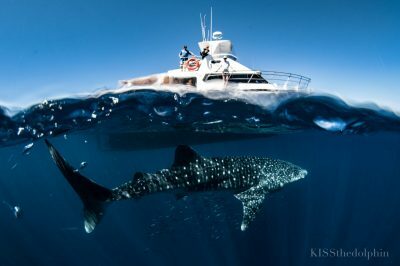 Whale sharks prefer warm and temperate seas, and while they can be found in several other locations around the world for a month or two, there is no place quite like Ningaloo Reef to meet naturally-feeding whale sharks in such a large congregation across such an extended season. You’ll be awestruck by their size and beauty.